The Parasaurolophus (par-ah-SAWR-OL-uh-fus) or Parasaur is one of the Dinosaurs in ARK: Survival Evolved. It is also referred to as "The poor man's Iguanodon" for the fact that it serves the same purpose as an Iguanodon, but can be tamed much earlier in the game. Parasaurolophus amphibio has one of the more interesting adaptations of any creature I've seen on the Island. Like all Parasaur, it has a signature crest on its head. Very docile at first, I've been able to approach the creature without disturbing it. If startled, however, the creature can vocalize a distress call to the surrounding area that warns of danger. Parasaurolophus appears to be low on the food chain and is hunted by everything, creatures and humans alike, which explains its skittish nature. It is a good source of meat and hide, if you can manage to keep up with it long enough to kill it. Despite being what most tribes consider a relatively useless creature to tame, I once met an interesting woman who had tamed an entire herd of them. She informed me that many overlooked the creature's potential. She even graciously gifted me a fancy saddle to put on my own Parasaurolophus one day. As a relatively simple creature to domesticate, Parasaurolophus is commonly one of the first mounts a tribe will be able to acquire. Its ability to run relatively fast for lengthy intervals makes it a solid mode of medium-range transportation, though it has almost no ability to defend itself or its rider in a traditional sense. Smaller creatures, however, appear to be frightened by the horn of Parasaurolophus although it doesn't do much damage. It also has decent weight-bearing capabilities, which could prove useful for nomadic tribes as they work to establish a presence on the Island. Parasaurs are one of the passive dinosaurs, and will not fight back even when attacked unless you take one of their eggs. 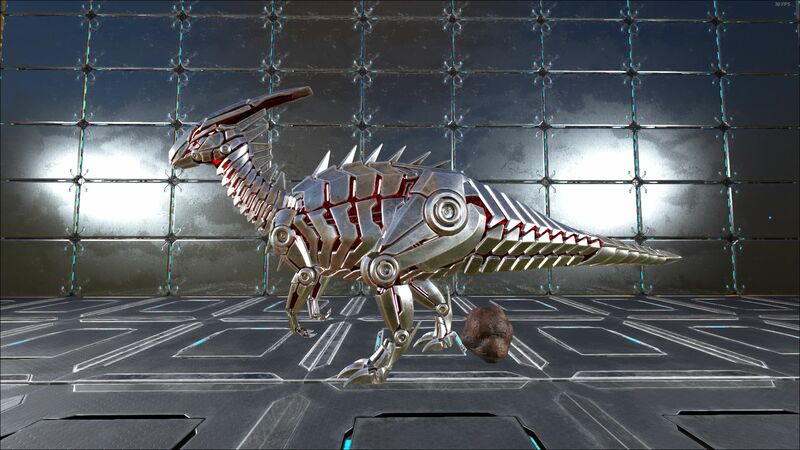 However, the Parasaur is one of the fastest sprinting dinosaurs in the ARK, and can be quite tricky to catch. A large, bipedal dinosaur of the hadrosaurid/duck-billed variety, the Parasaur is well known for its long, arching head crest and duck bill. They most often appear as variations of red and green, oftentimes with vibrant, red, white, or yellow spines. You can also find them in black but it is very rare. This section displays the Parasaur's natural colors and regions. For demonstration, the regions below are colored red over an albino Parasaur. The colored squares shown underneath each region's description are the colors that the Parasaur will randomly spawn with to provide an overall range of its natural color scheme. Hover your cursor over a color to display its name and ID. 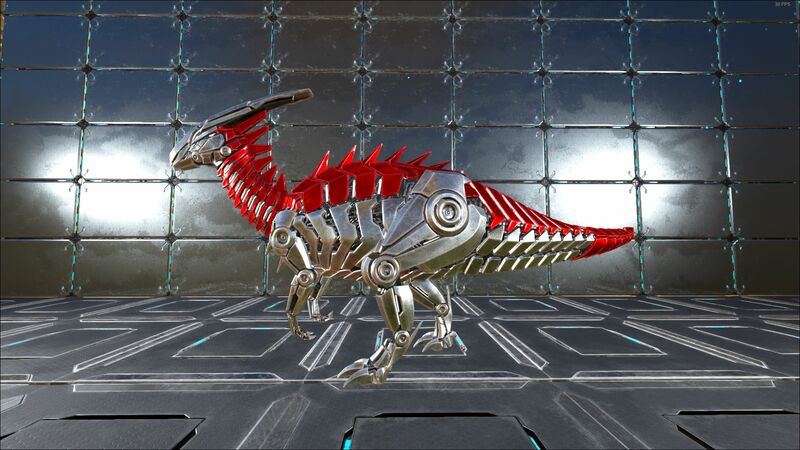 For example, "cheat SetTargetDinoColor 0 6" would color the Parasaur's "body" magenta. 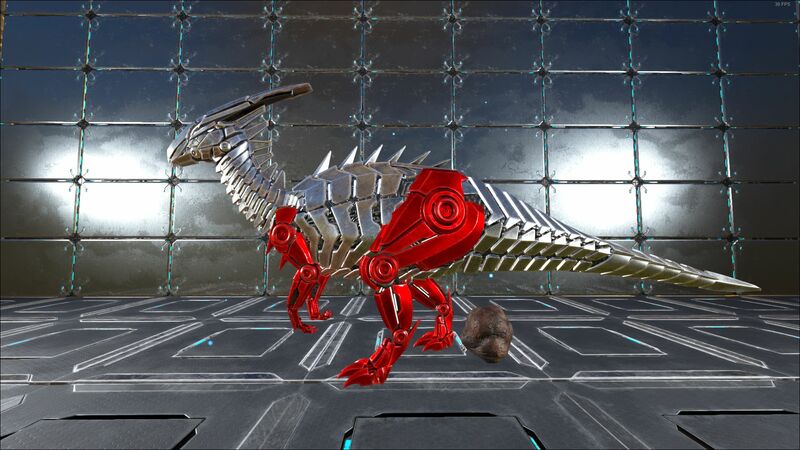 For example, "cheat SetTargetDinoColor 0 6" would color the Parasaur's "inner body" magenta. The Tek Parasaur is a creature that was permanently added to the game in the Extinction Chronicles IV event. It is a unique alternate of the original Parasaur, and is purely made of Tek. Unlike the original, they spawn at a 5% rate at a 20% higher level than usual. Knocking a Parasaur out is a tough thing to do, as they will run much quicker than humans can, once they are attacked. One of the best strategies is to get the Parasaur stuck between some rocks or trees and merely punch it. Be careful not to damage it once it is knocked out as that affects the taming effectiveness. There is also another method of knocking out a Parasaur, this method consists of using the bolas on its legs which immobilizes the creature. This leads to the creature being open to punches/slingshots which will eventually knock it out. Another method is to use multiple players to "pen" the Parasaur into a location it can't escape, leading it towards rocks or structures. This section describes how to fight against the Parasaur. Fighting a Parasaur holds no inherent danger, as they will flee upon initiating. The main risk from attempting to kill / KO a Parasaur is that while giving chase, the Parasaur leads the player into hostile territory. Parasaurs will not react if you steal their eggs. The most efficient method is to initiate with a Bola strike to the legs, immobilizing the Parasaur more than long enough to knock it down with a Wooden Club or spear it to death. Without a Bola, the Parasaur will run away when threatened, often getting itself stuck on rocks or trees, again leaving it vulnerable. A good idea for players without the bola engram is to position yourself away from where you wish to scare the Parasaur into such as a dead end or trees, this can turn a potentially lengthy chase into a quick kill. Quickly volley arrows into it or spears so it cannot get a chance to run in the first place. Dilo are good when trying to kill this dino at very little cost. A small pack of three or four will slow the parasaur to a speed the player can get some hits with a spear and kill it before it recovers. Any weaponry will suffice in taking down a Parasaur, as long as it is used to its highest efficiency. Melee weapons should be used by launching an impromptu attack on the head for greater damage. Ranged weapons can take one down during a chase. The Parasaur may run into more hostile areas when being chased, increasing the risk of aggravating more dangerous dinosaurs. A casual hunting party can be devastated by the appearance of a Rex. Because Parasaurs are able to clip into other dinosaurs, you may find running into them while hunting with a mount causes the Parasaur to lock into place. Otherwise, their relatively low health, fleeing nature and large size make them easy prey for a player of any level. Parasaur can honk to scare small wild/enemy creatures away when they are near them. Transport: While not able to carry as many supplies as larger creatures, Parasaurs are a good beginner's pack animal (Level up Weight, Speed, and Stamina). Travel: Parasaurs are a good mount for a starting player, but can be difficult to corner due to their tendency to run away. While much slower than a Raptor or Sabertooth, they are faster than Phiomia. Unlike other options however, the Parasaur is reasonably fast in and underwater; making it a good ATV choice as it can outrun land based threats and outswim water based threats. With this and low stamina drain, even a reasonably trained Parasaur is capable of diving to underwater caves after some speed and oxygen investment. Consider leveling only speed and some oxygen, with stamina as needed. Dino-Clamp/Parasaur Hunter: Because of the Parasaur's small footprint and relatively large hit box it can clip into the hit boxes of other wild Dinos and lock them in place, this is especially true of other Parasaurs. 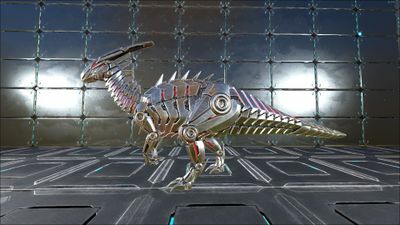 Simply pull up parallel to them and then rotate 90° so that you are heavily clipping into them, this will lock them in place and allow you to easily kill them with your Parasaur. This is an excellent source of very early game meat and hide. 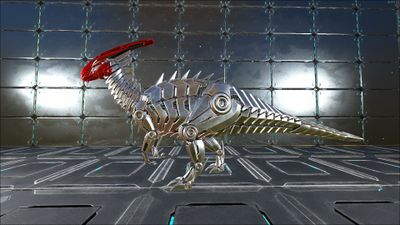 It's typically less reliable when locking other types of creatures in place, but still possible, you could for example lock a Trike in place and shoot tranq arrows into its head from a safe distance where it will not swing to damage you or your Parasaur (Level up Health). Diversion: One use for Parasaur is to agro and lead away a tribe's tames during a raid. All you need is a spyglass. You get a Parasaur to hit an enemy dino and then whistle for it to attack a wild dino in the distance. As parasaurs are cheap to tame they are a good choice for this often suicidal role (Level up Health, Speed, and Stamina). Early Berry Gathering: While other dinos are more specialized at berry gathering, even a low-level Parasaur can gather dozens of berries in the time it would take a human to gather a handful. Parasaurs can make it much easier for beginning survivors to collect enough Narcoberries to tame a more efficient berry gatherer such as a Trike or Stego; just be mindful of their narrow hit radius when munching berry plants. Living Tripwire: When placed in Turret mode, Parasaur can notify audibly and visually towards nearby threat. If used while ridden, it just visually detects for nearby threat. Enabling consumes food. The genus name Parasaurolophus means 'near crested lizard', in reference to Saurolophus, which Parasaur was initially believed to be a close relative of. The species name of the Parasaurolophus on the ARK, 'amphibio', is in reference to the species affinity for water, being often found on the coast or near rivers, as well as its proficiency at swimming. Like many hadrosaurs, Parasaurolophus is thought to be able to walk on either two or four limbs. The animal would spend most of its time on four limbs, feeding or traveling long distances. When it needed to reach higher to forage or move with speed to escape predators, it would raise up onto its hind limbs. The Parasaurolophus in ARK, however, appears to only walk using its hind limbs. The real life Parasaurolophus seems to be significantly larger than the Parasaur found in ARK. The real life variant also seems to have a bulkier body with a smaller head. This page was last edited on 21 April 2019, at 22:21.